Continuity mistake: As Jack Kelly rides the horse near the end of the "Santa Fe" sequence, his hat is waving behind him. When it cuts to a different angle the hat is on his head. Note: This was a specific detail put in by the director, symbolizing the boy's mental transition from New York to Santa Fe. However, it failed and is commonly seen as an editing mistake. Factual error: During the big Newsies rally when Medda is singing "High Times", as she is swinging, lighted exit signs can be seen. I don't believe that those were around in 1899. Continuity mistake: During the opening number, The kid with the brown, hard, top hat (as the boys are at the gate and when the Delancy Brothers are there) messes up the kids hair in fornt of him. When he puts his hat on correctly his hair is hanging down on the right side. Later his hat is off and when the camera switches angles a split second later, the hat returns. Other mistake: When Pulitzer is reading the headline "Trolley Strike Drags on for Third Week" out loud he uses the magnifying glass to read, but reads faster than he is dragging it. Continuity mistake: At Puliter office "Looking For Ways to Make More Money" there is no note paper on the table. After going through the options Sikes mysteriously picks up a piece of paper and reads it. Factual error: When Jack Kelly and David go to see Spot, Spot is wearing a jacket with his sleeves rolled up. When he shakes Jack Kelly's hand, you can see the tan line from his watch. Visible crew/equipment: When the three boys are leaning up in their chairs in the "King of New York" song, there are hands visible that are pushing the chairs up. Continuity mistake: While hiding from Snyder in Meddas place, Les is standing next to the guy with a puppet but moments later that same guy is seen moving next to Les to where he should already be. Continuity mistake: In "Once and For All" Jack's shirt changes color, between shots. Continuity mistake: During "Seize the Day" you see all of the banner material is on the left side of the statue then it is gone. Other mistake: In the scene after "King of New York" when they are planning the rally, Kid Blink is in the back and is supposed to be handed a drink, but gets passed by, so he shares the drink for the toast with the Newsie next to him. Continuity mistake: During the Santa Fe number, Jack has his rope tied around his waist. As he comes down the street past wagon and hops on horse he does not have the rope anymore. Deliberate mistake: When David brings Jack home to meet the family and at the beginning of Santa Fe number.It starts raining buckets during dinner and the cake scene, but less than a minute passes and it is dry enough to sit down on the stairs at the beginning of the Santa Fe number. Then during the song "Santa Fe" and later in the dance sequence, the ground is dry as Jack is kicking up dust. 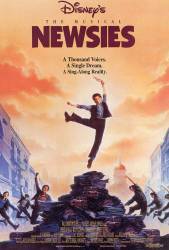 Continuity mistake: Right after Jack and David get back from Brooklyn, the newsies are standing around a statue listening to Jack tell them the results of the visit to Spot. Racetrack is smoking a cigarette. He says, "Maybe we should hold off for a while" (or something to that effect), and then puts the cigarette to his mouth. The shot changes angles and Racetrack's hand is down by his side. There's no way he could have moved that quickly. Continuity mistake: In the opening Song "Carrying the Banner" Jack is talking to Mush and turns away from him as he is trying to button his pants, his shirt is tucked in as well. After he lathers his face and throws shaving cream at Mush he starts to sing and if you look, his pants appears buttoned and his shirt is hanging out. Continuity mistake: During "Seize the day Number' there are 2 boys on the statue, mere seconds later there are four boys and we see one get down, but in the next shot there are 5 boys on the statue.